I am typing this while waiting for the first session to begin at BlogHer 10. New York City, baby! My journey started Wednesday when I drove the kids up to Milwaukee to stay with my wonderful and daring in-laws. I say daring because although Epu and I tried our best, we did not quite get Toth sleeping through the night before this big weekend. Yes, well. I guess it won't be the first sleepless night they've spent with a baby, since they had four themselves. Thanks, guys. Thursday morning at dawn I hugged a sleepy Nutmeg goodbye and kissed the others while they slept, hugged my mother-in-law, and then my father-in-law drove me to Mitchell Field. Do you know how easy it is to fly somewhere without children? I booked a Super Shuttle with my new Droid smartphone while sitting on the runway, waltzed right out of LaGuardia onto the shuttle upon arrival, and after a sweaty hour of claustrophobia and carsickness, there I was in the heart of NYC. Last night I got to see Bernadette Peters and Elaine Stricht in "A Little Night Music," comped, thanks to Meagan Francis' mad organizing skillz. It was fantastic! I met up with some more of the moms of the former Chicago Moms Blog, now of The Chicago Moms. Then after midnight (first night, so I turned in early) I crept into the room I'm sharing with three until-yesterday total strangers, Sara, Tara and Caitlin, and got a few hours of sleep. 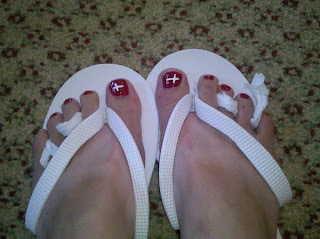 Then this morning it was up and at 'em to get the Danish flag painted onto my toenails at the Ecco shoes suite! Oh yes, lots of serious conference business being done here. Stay tuned. Or, if you want to follow my Blogher adventure in real time, follow me on Twitter as @carriekirby. I can't promise a zillion Tweets because I am still learning how to use my new Droid phone, but ya never know. I could become an expert by this afternoon.